The other day I overheard a conversation among women about food. Some of them were praising one of them for how “perfectly” she ate. She responded that she wasn’t “a perfect eater” which she was totally OK with because she loves cinnamon rolls. Then they praised her even more for how much they appreciated her honesty and realness. You know, she was so down to earth and everything. I’m sure these are lovely women who I would probably really like if I got to know … but I knew a blogpost was coming. Because here’s the thing – is “realness” and “embracing imperfection” really about admitting that we don’t always follow food rules perfectly? In fact, that conversation highlights perfectly the exact issue we have with food: food morality. We are good or bad, eating clean or dirty, being obedient or cheating, feeling virtuous or guilty. Food has become a religion, maybe even better described as a cult. 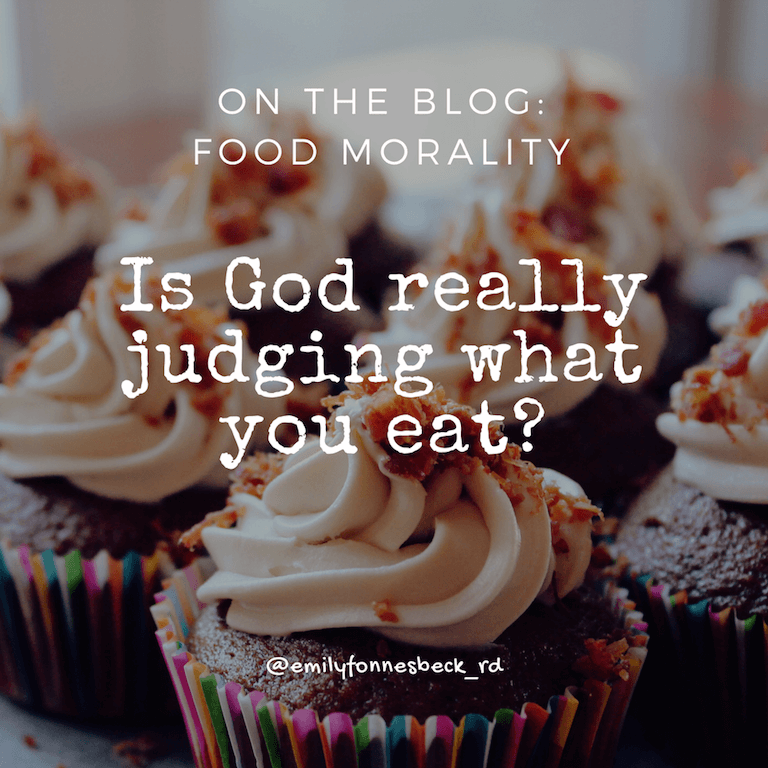 As humans we are inherently imperfect and will make mistakes which makes us vulnerable to these messages that following food rules can make us feel more worthy and pure. But maybe to still feel honest and human and relatable, we admit our food sins? I guess this always hits close to home because I am religious, a Christian to be more descriptive. I firmly believe that one of the biggest distractions in life is fixation on body image, declaring our faith to a certain diet or way of eating and calling it perfection. We worship food rules and fit bodies instead of worshipping a loving Heavenly Father and the Savior of the world. This holds us back from really growing and progressing in ways that matter. I should be clear – I don’t think that wanting to feel well nourished and be physically fit are inherently wrong (I would probably fit into that category), but I hope we can all agree that making it priority, going to extremes and measuring our worth and value based on what we do or don’t eat or how we do or don’t look is mentally, physically, emotionally and spiritually unhealthy. But we do that. It may be subtle and because of the culture we live in, we may not even realize we are doing it since it’s become so normalized. We measure the quality of our day by how well we ate, not how well we loved. We avoid making memories because of how we look instead of using our talents and abilities to bless the lives of others. We sit around and praise other women (and men) for how they look and what they eat instead of who they are and what they do. Maybe it’s worth noting that my faith and beliefs are that we will be perfected one day. Not on our own though, it’s through grace and good works. It won’t happen in this lifetime and likely not that soon in the next. But perfection is something I think is actually attainable one day, but not something I think we as humans are ever capable of on our own. I also think that God’s idea of perfection is much different than ours, particularly when it comes our bodies and our food. What we eat is never indicative of our worth or value. We are inherently worthy. Also, I’m of the opinion that God is not going to judge you for eating chocolate cake. He’s also not going to exalt you for eating lots of green smoothies. I genuinely think he’ll care more about who you’ve become rather than what food you’ve eaten. When I was struggling with Orthorexia, I avoided all social gatherings (or at least said I wasn’t hungry or had already eaten). This included family dinners at my parent’s house. My mom is a great cook and I love all her recipes. Some of them include condensed soups (you know, like cream of chicken, cream of mushroom, etc) and I avoided them at all costs when I was in my eating disorder. I remember one day having the distinct impression that those meals were made for me with love. My mom loved me and her food would never hurt me. As a Christian I really do try (VERY imperfectly) to think about what Christ would do and make an attempt to try to kind of do the same. I know without a doubt that He would gladly accept whatever she offered Him, including her recipes with condensed soups. I’m pretty certain it wouldn’t even cross His mind because He would be more concerned with what was in her heart, not her enchiladas. That was really pivotal for me because it exposed a HUGE incongruence between my behaviors and what I truly valued. Really, overcoming Orthorexia was a huge lesson in humility for me. A very common characteristic is feelings of superiority when following food rules, which I definitely experienced. It’s still difficult to admit that but I think it’s a good example that highlights why I felt so anxious all the time – I wasn’t living according to what I truly valued. It’s because I made peace with food that I was able to make peace with myself and peace with God. I totally believe the first step away from God is to see yourself different than someone else. “Aren’t we all beggars?” The idea of food morality and clean eating just feels so elitist, likely because of how I felt when I subscribed to that way of thinking. In conclusion, I respect that everyone’s beliefs are different and I’m not writing to convince you of anything other than you deserve better than to feel judged for how you eat. I’m also definitely not saying that following food rules or a diet makes anyone evil, but that you are inherently worthy and do not need a diet to save you. I think setting the intention to live a life full of things that bring meaning and feel valuable will probably make you happiest. I hope you’ll make a difference in this world because of your talents and wisdom and gifts, not because of what you eat or how you look. 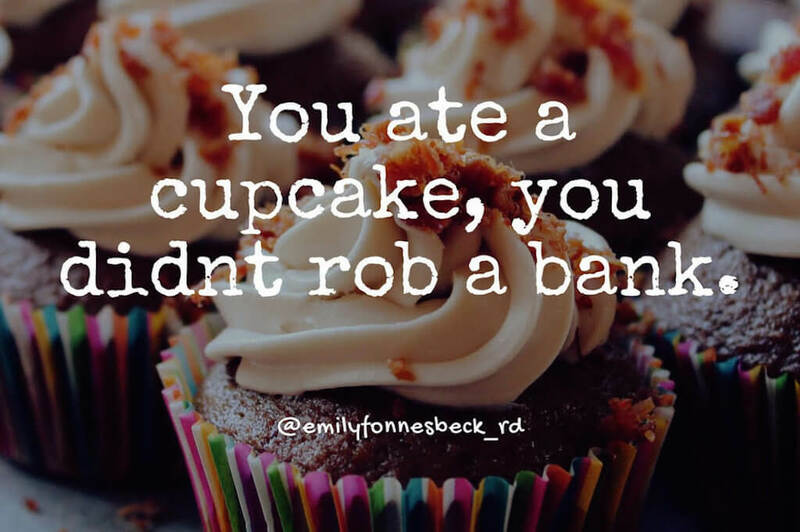 Thank you so much for posting this, Emily! There are far too many things you wrote that stood out to me, but overall – just yes, to everything. Food and health, while part of our daily lives, can be such a distraction from living in our current culture. When you start to really pay attention to where our/ our society’s attention goes, it is so mind opening (and mind-boggling). Thank you again for sharing so vulnerably!! Thank you for reading and sharing, Lindsey – that means a lot. So well said – food and health is just a part of our lives but it’s so easy to get trapped in thinking it matters more than it does. You’re the best – thanks, friend! I love this. It is beautifully written. Also, have you seen the movie Chocolat? The things you are saying remind me of that movie! The whole basis of the movie is that chocolate is "unclean" and "sinful" and prevents a relationship with God. In the end, they found out they were spreading hate by pushing these ideals on people in the town…and chocolate + God won everyone’s hearts in the end 🙂 🙂 And the young Johnny Depp is in it so that wasn’t so bad either! Beautifully written. I resonate with this post immensely. During my eating disorder I used to lay in bed at night thinking, "My life has to me more than this." If we are looking big picture, looking towards eternity, it really doesn’t matter what we eat. It matters who we loved. Thank you for writing this!! LOVE THIS!!!!! Thanks so much !!!! I’m so glad – thanks Julie! Thank you! I loved every bit of this article!!!! I found your site through a podcast I was listening to yesterday in which you were interviewed. This article above really hit me. I have been thinking about my skewed relationship with food, but I don’t know what to do about it. My issues stem from increased intolerances. I haven’t been able to find much info on people who become phobic of things and get stressed and therefore become sicker and adverse to more foods. Have you ever written on this particular issue or know someone who has. I have realized the problem, but do not know how to get out of it. I too am a Christian and believe that ultimately He is my only hope, but it is not as simple as just taking a deep breathe and moving on. I hope it’s helpful, would love to hear your thoughts! I read this blog post earlier this summer and to be honest, I didn’t quite get it. then But reading it again today, I totally agree with you. I was reading Romans 12:1-2 yesterday in my devotional and God used it to remind me that presenting my body as a living sacrifice to Him is about not obsessing over my body, and being transformed by the renewing of my mind is about not being obsessed with food. I’ve been learning about and beginning to practice intuitive eating lately, and the key for me is to realize that my life is about glorifying God and that talking about food distracts from the truth of the gospel that I should be sharing with people instead. I have started feeling uncomfortable when people compliment me on my food choices. I just eat what makes me feel good and that’s that. No judgment of them, no justifying of myself. Food is food, and eternity is infinitely more important. I’m so glad this resonated with you, Kaylyn! "eternity is infinitely more important" – couldn’t agree more! I’m so glad I was directed here… just read this post and treasure it! This is great to hear! So glad you found it helpful, Carol!